"A great wolf round-up is to be the feature of West Saline next Monday. The party will number into the hundreds, and forty trained dogs will make the assault. A square of twelve miles, starting at the Eden farm 9 miles south of Brookville will be compassed. The north boundary line will be the railroad, south line the Smoky river, west line will be a direct line from Carneiro to the river and Brookville to the river will be the east line." Can you imagine getting a couple hundred folks together and driving all the coyotes and wolves out of a twelve square mile area to try getting rid of them? Thank god for e-callers. Hunt smarter, not harder, huh? I wonder if that was back in the day they use horse back instead of trucks. That's the way the old timers hunted around here was from horse back, hell they even hunted quail from horse back. Those were some tough and hard working people back then. When young,back in the 50s,Sportsmens Clubs in Mn would often do that on Sundays with fox.Big group,shotguns only,surround 1 to 4 sq miles and all walk toward the middle.Smart asses like us would run to the middle and wait.Lots of fox,lots of fun. Eddie, this was in 1895, so yeah, probably some on horseback. Many on foot. I ran into a guy today who has a picture I've tried to buy from him on his basement wall. It's about three feet long and a foot tall, old timey black and white, probably 50 people or better with all manner of old guns and several dead coyotes in front of the front row where a bunch of kids are sitting cross legged. Still can't get him to sell it, but he agreed to take pics with his phone - 3 or 4 from one end to the other - and email them to me so I can print them out and try to piece them together as one. Wanna build a barn wood frame for it and hang it on the family room wall. It looks to be from the very early 1900's. That's the way this country dealt with wolves and coyotes before cars, trucks and calling. 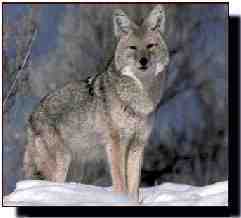 Good luck on the picture, I got a golfing buddy that runs coyotes with dogs. He told me that up in Osage country they would have those kind of hunts every weekend during the winter. He's 71 but can remember going as a kid. His dad trained horses for wolf hunting as they called it back then. I bet that would have been something to see coming across the prairie. My dad shared with me a few stories of jack rabbit round ups, done much like the stories above, where a bunch of guys would surround a section of ground and start walking to the middle.